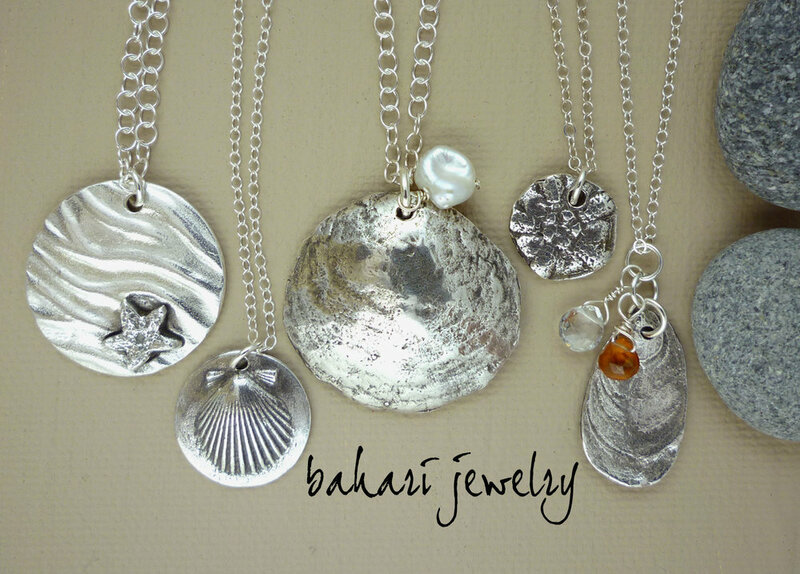 Our featured artist for November is Mary Harrington of Bahari Jewelry! Living on Cape Cod and spending long hours on the beaches, inspired Mary Harrington to create Bahari Jewelry. Many of the shells and plants used in the designs are collected during her walks along the Cape’s beaches. As the jewelry reflects the appreciation she has for the beauty of the life and forms found in and around the ocean, she chose to use the name Bahari, the Swahili word for sea. Mary is self-taught, and is continually exploring new techniques and expressions. Bahari Jewelry is centered around being true to nature. The jewelry itself reflects the patterns of the natural shapes and living creatures of the sea. The pieces have an organic feel, not highly refined or polished, staying true to their original forms. Bahari Jewelry respects nature and the environment by using recycled materials and responsibly harvested materials whenever available, and recycling materials as much as possible. Jewelry is the most personal accessory you have, worn next to the skin, expressing who you are and what you love. The artist’s hope is that the pieces will resonate with you, bringing the peace and beauty of the ocean home to you each time you wear it. Below is a representation of some of Mary’s work. Click on images to expand view and of course feel free to contact Under The Sun directly, to inquire about availability and get additional information.